Okay, so the Auberge de l’Âtre in Quarré-les-Tombes, Burgundy is not exactly a hidden gem that nobody knows about. It did have a Michelin star and it’s a well-known spot in culinary circles, but for the vast majority of Irish people, this gem of a restaurant is on one of the whitest spaces on the map of France. 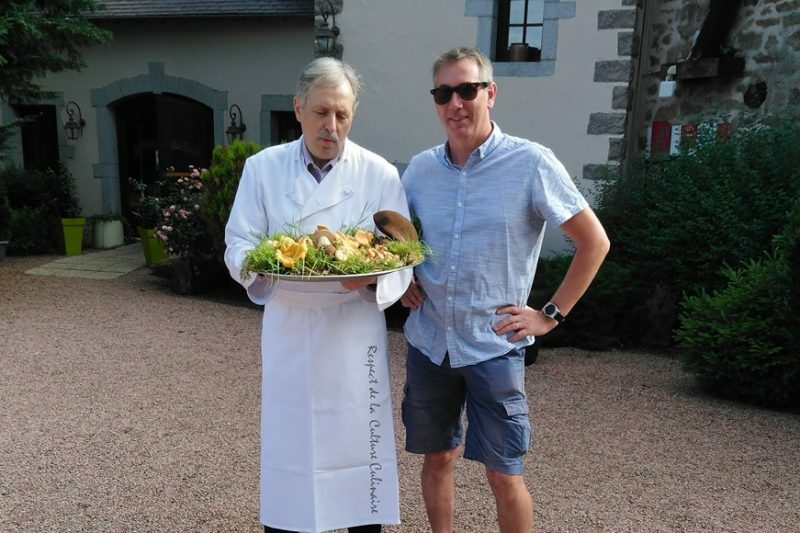 I had come to the Auberge de l’Âtre without any preconceptions but knowing, of course, that if it was in Burgundy, then you simply can’t go wrong. There are many places you can go in this world and experience superb food and wine but there is no country in the world that comes even close to comparing with France for a deep tradition of great food and wine and gastronomic appreciation and within France, there’s arguably no better region than Burgundy in this regard. The owners – Francis and Odole Salamolard – are steeped in culinary greatness and their food and wine is their life and their passion. This is not something immediately obvious when you first arrive at this discreetly located extended farmhouse in the countryside near Quarré-les-Tombes – a tiny hamlet in the Yonne department and in the Morvan National Park. They have worked with all the greats, including the recently-deceased Paul Bocuse and the great Bernard Loiseau. Their greeting is informal, friendly and deferential, like you’re being welcomed into an old friend’s home in the countryside. Mmmm… main course! The girolles mushrooms were a highlight of the main course. They opened the Auberge de l’Atre in the mid-1980s and have extended it on either wing to create accommodation and copious dining facilities. Francis gave us the honour of showing us his cellar. Francis’ collection has been reduced somewhat over recent years. After all, wines don’t stay good forever. They have to be consumed at some point and he sells them off during two special events each year. “I’ve had lots of interest from the likes of Forbes and other auction houses, but I prefer to share the pleasure of these wines with ordinary people rather than sell them at auction to some company who only views them as a commodity,” he says. For our dinner, he has selected something very special. He refers to it as one of his “orphans” – a bottle that he put aside as coming from a particular cru that displayed a certain level of acidity that, he said, could very well mature into something special if put down for a number of decades. Rustic regality: the Auberge de l’Atre. In this case, it was a 1er cru Chablis from the domaine of Alain Geoffroy in the Vau Ligneau region of Burgundy. Its label was barely legible. Francis had put it down in 1993. The dinner commenced with refreshing house cocktail of a local crémant de Bourgogne base. It was followed by a delicate amuse-bouche and starter of smoked rabbit salad. Simple but exquisite. It was accompanied by a 2011 Bourgougne Vézelay chablis wine from the La Cadette domaine. It was a cracking Chardonnay wine. However, when the main course came out, so too did our orphan bottle that had been carefully selected by Francis. The same grape variety and the same overall wine region but this 25-year-old bottle was a completely different animal. The table was silent as everyone (all five of us) savoured the soft buttery texture and the parade of subtle rounded flavours that invaded our mouths with every sip. The Zander (not a fish common to Irish waters but a close relative of the pike) provided the main course in a lightly saffroned form and superbly accompanied by a crémant-de-Bourgogne sauce, with delicious vegetables and , stupendous freshly-picked girolles mushrooms. Like a great fireworks display, the cheese trolley and three-dessert platter cranked up the action in terms of presentation and flavour and the final wine was a red Burgundy from 2013 – also a knockout but nothing could compare with the 1993 Vau Ligneau. And on that profound note, it was time to say Au Revoir to the Auberge. For information on prices for staying and eating at the Auberge de l’Atre, see the website here. For further information on Burgundy and the newly-extended region of Bourgogne-Franche-Comté, click here.